You are expected to know the 3 branches of government of Nigeria. This is one of the most fundamental concepts asked in JAMB government questions. 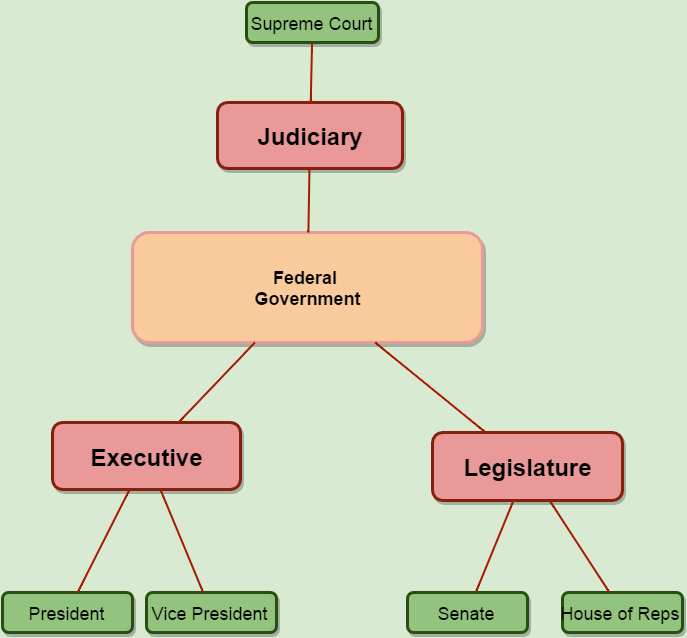 The following diagram illustrates the 3 branches of government in Nigeria. 1) What is the point of splitting the government into several equal parts? 2) What is the national assembly broken into two? What are the differences between The House of Reps and the Senate? 3) What role does the vice president place? The vice plays and executive role right? There seems to be some confusion about the difference between the house of reps and senate. First lets start with the similarities. 1) They are both part of the Federal Government 2) They are both part of the legislature, which means they are the ones that make new laws and approve budgets. Now here are the just some of differences: 1) Although both house and senate work on laws and bills, the house is reposible for initiating the process. 2) The senate is responsible for approving the presidents ministers and other key appointees 3) Only the senate can remove the president from office (requiring a 2/3 super majority) 4) Every state in Nigeria gets 3 senators (109 total) whereas 5) The number of House of reps members a state sends to the National Assembly depends on the population of that state. So obviously Lagos and Kano have the largest number of house of reps members (24 each) out of the total 360..